It has been roasting hot today and I have been stuck in an office with 3 foot thick granite walls. 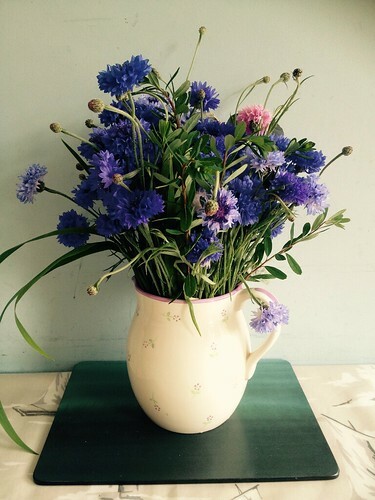 On the way back from a meeting I picked up these gorgeous flowers on a ‘hedge veg’ stall. Today we harvested the first fruit from our vegetable patch. I love being able to go and collect the fruit and veg and The Little Mister really loves to see what is ready. His favourites are ‘braspberries’! We now have planted broad beans (doing very badly), sugar snap peas (taking a very long time to get gonig!) courgettes, tomatoes, purple beans, dwarf French beans and runner beans. 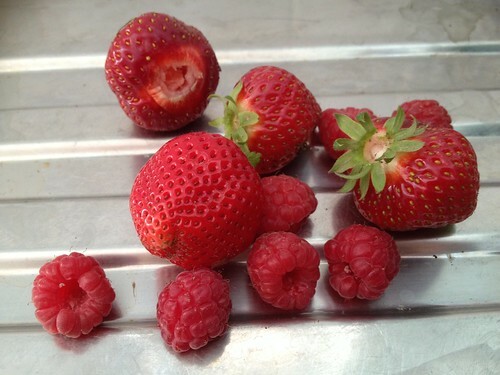 We also have raspberries, loganberries, strawberries, apples, pears and blackberries. Here’s hoping for a fruitful harvest. 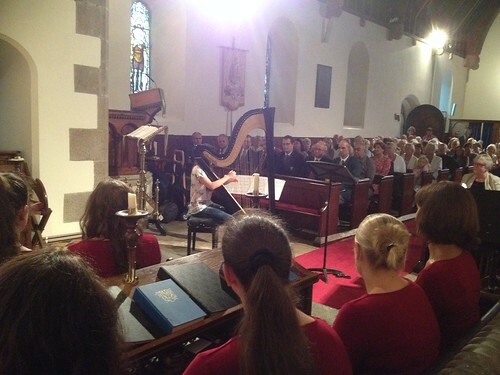 Tonight I was singing in a choir concert with Bel Canto and we were joined by the Guernsey Welsh Boys choir, a harp player and a solo percussionist. We were really worried that there might not be too many people in the audience but there was standing room only. Singing makes me happy. Being with my friends makes me happy. Not a bad way to end a busy (and slightly stressful at times) weekend. We had a really busy day in the garden on Saturday. 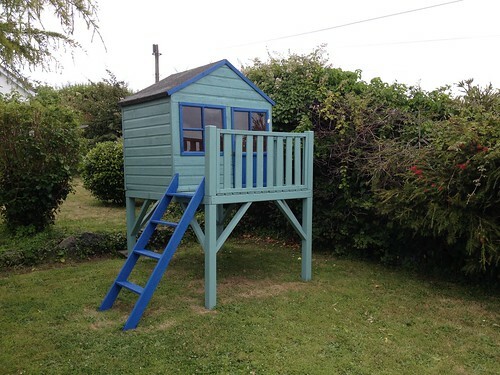 The Mister cut some of the hedges and I finished off painting the kids playhouse. Now to say that this house was in a pretty dilapidated condition when we got it I have to admit that it looks pretty good now! The children absolutely love it and the amount of paint that has been slapped on it means that it should last for some time! This is literally the only photo I took on Friday! It is of The Little Miss wearing her big brothers pants. He was very reluctant to wear his big boys pants so we were trying to give him some encouragement! It was such a gorgeous day today and I was massively envious of my childminder and my sister who were at the beach looking after The Little Miss and The Little Mister respectively. Whilst they were gallavanting down the beach I was stuck in a sweaty office. Oh well. Needs must eh?! I managed to get half an hour sitting on the sand although this little lady did not look too impressed to be back on the beach again! How sweet are these??!! 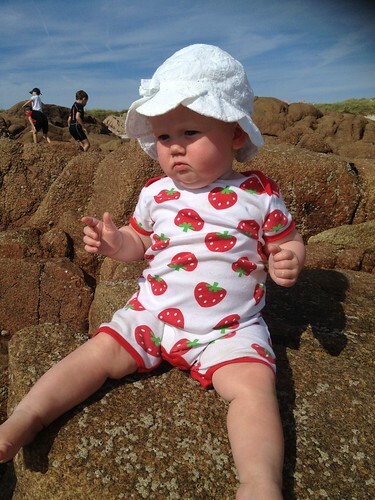 Today these cute little pants arrived in the post along with several others from Grandma Beryl. 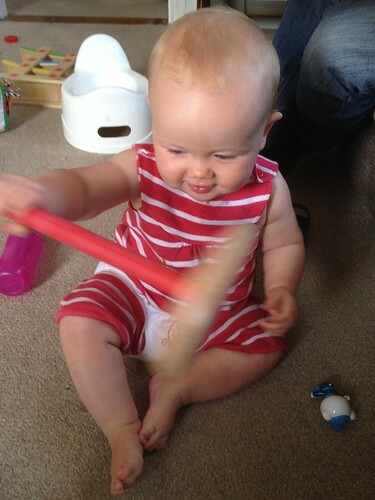 At the end of this week we will make a stab at potty training The Little Mister and see how we get on. 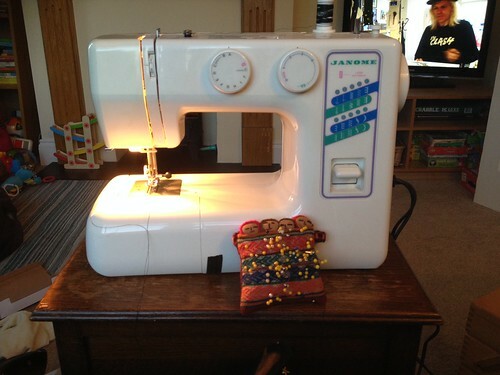 I used to love sewing and I would happily spend many hours engaging in this hobby. Unfortunately I know have children and half my evening seems to be taken up with housework, tidying and general other stuff. However, I have been making some wizard cloaks for a friend so I have spent a happy couple of hours trying my level best to work out the pattern. I think I am getting there now! I wish I had a bit more time to get on with it though! We had one of those nights last night. The Little Miss woke at 1ish for a feed and then she proceeded to treat me like an all night milk buffet before waking at 4am wanting to play. 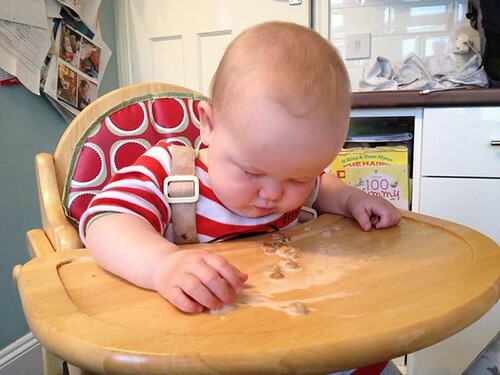 The Mister eventually got up with her at 5am to give her breakfast, unfortunately by 6am she was asleep in her highchair. Let’s hope for a better night! Father’s Day and today I today we have spent it as a family. In the evening we had a barbcue with my Dad and my sister and her family. At lunchtime we went to the park where we watched a local wind band played whilst we had a picnic and then we had a wander around the classic card show which The Little Mister and The Mister both enjoyed. I love this man so much. 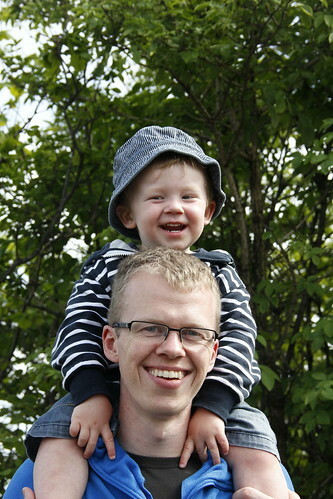 He is a brilliant husband and a rather wonderful father. I couldn’t ask for more.